What are Turf Toe Injuries? Commonly reported as a sports-related injury, turf toe refers to a condition where there is damage to structures around the big toe caused by hyperextension (bending the toe back too far) (McCormick & Anderson, 2010). Pushing forcefully off the big toe, as people do when they begin to run or jump, places repeated stress on the metatarsophalangeal joints (MTP) around this area. Sports that involve frequent stopping, starting, and sudden changes of direction (e.g. basketball, soccer, etc.) can be a main cause of turf toe. 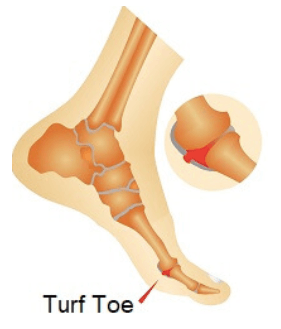 Symptoms of turf toe include pain when extending the big toe, or bearing weight upon it, a “popping” feeling in the foot when the injury occurs, swelling and inflammation, as well as instability and limited movement of the big toe. According to a report by McCormick & Anderson (2010), most turf toe injuries are mild and do not require surgical treatment, however in more severe cases, surgical procedures may be necessary. Doctors grade turf toe injuries from 1 to 3 depending on the extent of damage to the MTP joint, sesamoids, and surrounding tissues, ligaments, and tendons (McCormick & Anderson, 2010). Grade 3: Plantar complex is torn, leading to severe tenderness, swelling and bruising. The toe is very painful and difficult to move. If you have injured your shoulder rotator cuff but can still move it then this might be the right exercise for you. With a light exercise band tied at shoulder level proceed to take up the slack. Then placing a folded towel between your side and elbow and place your opposite hand onto your shoulder lightly to prevent it from hiking upwards. With the thumb up, slowly rotate the lower arm and wrist in towards your body making the upper arm and elbow the pivoting point and then bring the arm back to the start position with control. Prevent the elbow from pinching in towards your side or doing a chicken wing coming out. Do 3 sets of 10 repetitions for each side. Doing the unaffected side will also help with the neuromuscular rehab of the rotator cuff muscles. If you have any pain during the exercise or are unsure about what you are doing, consult your local Physiotherapist before continuing. Being the largest of the 26 bones in the foot, the calcaneus, or the heel bone, absorbs a majority of the weight of the body. 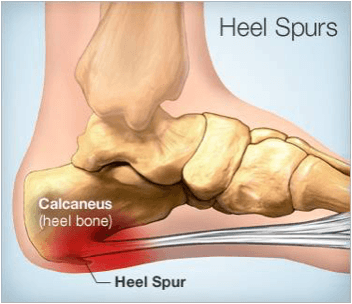 A heel spur is a bony growth that forms on the bottom or back of the heel bone (“Heel Spur”, 2005). Heel spurs are often related to a condition called plantar fasciitis, however it’s important to not get the two mixed up. A heel spur is a bony projection that occurs from the bottom of the heel along the plantar fascia, whereas plantar fasciitis is caused by an inflammatory process where the plantar fasciitis attaches to the heel due to an abnormal force being placed on it. It is important to differentiate between the two since plantar fasciitis will subside on its own over a period of time, whereas a heel spur will be there permanently, unless surgery is required. Symptoms of heel spurs can include pain, inflammation or swelling at the front of your heel (“Heel Spur”, 2005). The symptoms can spread to the arch of your foot, and a small bony protrusion may be eventually visible. However, only about 50% of people with heel spurs experience pain from them or even see a change in the soft tissue or bones surrounding the heel. Therefore, heel spurs are often discovered only through X-rays and other tests done for foot ailments. This exercise is great for the more advanced stages in the rehabilitation of your injured hamstring muscles. Place the ball of your foot on a chair or bench that is knee height and maintain this pressure throughout. Engage and pull your inner core muscles in below your belly button while you squat straight down keeping your body vertical. Do not extend beyond a ninety degree bend in your knee while your knee stays in line with your hip and second toe and above your foot. Perform 3 sets of 10 for each side. 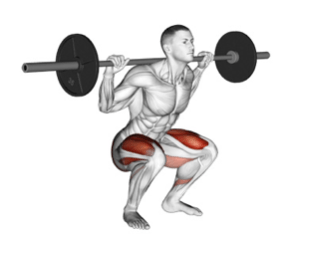 The Squat Lunge Hops is a variation or progression of this exercise to something more challenging. When you come back up from the squat, push up as high as you can comfortably aiming for a soft & controlled landing. Do not extend beyond a ninety degree bend in your knee while your knee stays in line with your hip and second toe and above your foot. Perform 3 sets of 10 for each side. Do your running injuries present as lower back pain? It’s possible that your hip mobility is restricted and that your core and hip flexor muscles are weak but you just don’t know it. This exercise may help. Wrap a closed loop resistance band around your feet. Start by doing a posterior pelvic tilt to flatten your lower back and keep the inner core muscles engaged below your belly button to stabilize this posture and move into a plank position on the wall. Then, bring one knee in a straight line up towards your chest and then lower it back down. To Progress this exercise, simply perform the exact same technique faster while you maintain control and stability when lifting and lower the knee back down.